So I looked up the Riverworld Series of books that this is part of, and it got made into a 2003 movie, “Riverworld“! It actually stars the late Kevin Smith, not of Clerks fame, but the one who played Ares in Hercules and Xena before his untimely death. From the trailers and clips it does have a certain Hercules / Xena tone to it. Maybe they used the same sets? There’s another one out soon, this year or next, also called Riverworld, and is supposedly a four hour epic! You are right about the star…golly. …could we do it for DVD covers and/or film posters maybe? But would our minds be able to handle the madness? i can see a lot of pound shop DVDs featuring…the fung fu ones are always genius though I guess they might not count as strictly fantasy or SF. Thats pretty disturbing cover. I woulldnt want to bump into him in a dark alley. Why read… when we can watch! You’d have thought the Fagin look-a-like would be a little more impressed by huge flying naked man. Shame naked dude doesn’t like flying. Theres few things worse than a poor TV adaption of a series you love. All your friends who you wanted to read the books will now just watch the crappy TV adaptation of it and judge it thusly… I was disapointed by the Dresden Files series, have heard bad things about the Tv adaptation of Sword of Truth series (awful covers). I dread the day they try to make The Wheel of Time into a TV series. Justin, the philip Jose game doesnt look TOO bad for a 1998 game, looks pretty complex. True, true. Too bad for the Riverworld game that it came out the same year as Baldur’s Gate, Diablo, Fallout 2, Heroes of Might & Magic 2, Dungeon Keeper 2, and Starcraft… couple of years earlier though and it would’ve had more of a chance. Weeks you would waste? Don’t you mean months? I know some men who meet up every week to LAN party starcraft on their laptops. Great series and concept. World of Tiers is quite good too. I am submitting the 1980 Panther release if anyone wants to see it. It actually depicts a scene in the book so I’m not sure if it breaks the rules. I’m going to have to check out the riverworld game now. Thanks for the tip JustinLeego. There is a version without the Hugo splash – yeah, it ain’t just the head that’s bald…..
God dang, they always put the sign where I don’t want it . . .
“Winner of the Hugo Award for the year’s best SF novel”. It’s all very metafictional — especially since the book later DID win the Hugo. OK, OK, I’m going. I’m hurrying, in fact! Is it the foreshortening, or is it really a man with a pig’s hindquarters? I’d suggest we have a tag for ‘strategically placed Hugo Award’ but I suppose it would link only to this book. Although maybe that wouldn’t be a bad thing?!? Isambard Kingdom Brunel’s newest bridge was not well received. A prescient cover. As of 2015, the Hugo Awards are indeed entirely about dicks. To Your Naked Body Goes Philip José Farmer? The show with everything except Yul Brynner… that’s Yul leaving to watch in the auditorium now. Except that the auditorium is in the show too. As are all his belongings, including clothes. So where will he sit? And what will he breathe if all the oxygen is in the show too? Isn’t this an over-elaborate production, and a nightmare to organise? All for Yul? What’s he done to deserve this? What if he doesn’t like it and the show with everything would have been better with him in it? WHY? I wonder what Captain Sir Richard Francis Burton would have to say about this cover, assuming that is Burton with the cane. No mention of Macy’s Thanksgiving Day Parade balloons so far. Disappointing. BC’s comment brought to you by Anheuser-Busch, Inc.
@BC – You’re the whiz! Artist update. 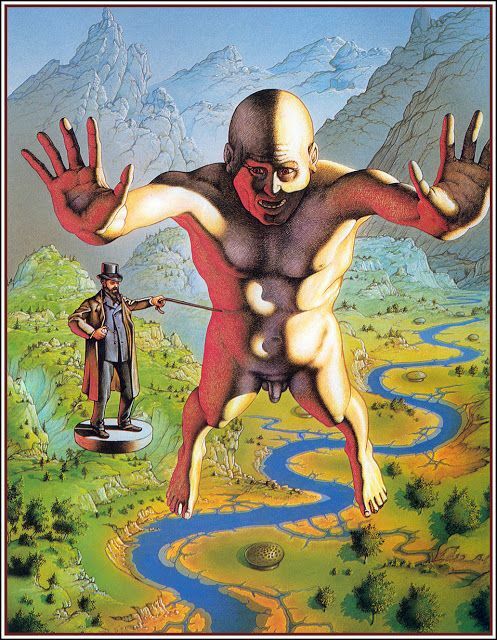 Unknown artist no longer: isfdb.org has him as Patrick Woodroffe. @TW – Unshuriken, but not unshrunken. In his unembarrassed state, lacking even a shuriken, we can plainly see that he has forgotten that key element of bungee-jumping, the bungee. Not a mistake you make twice. Today, Billy Joe MacAllister took off all of his clothes, stuck a suicide note over his man-parts and jumped off the Tallahatchie Bridge. Ah, Patrick Woodroffe, a fave here at GSS. That shuriken was ridiculously over-sized, wasn’t it? I’m thinking Isambard Kingdom Brunel is normal-size, and Macy’s Thanksgiving Day balloon is giant. But a huge bald naked man wouldn’t make it into the parade, so Brunel had to design bridges and ships (The balloon was considered for a Pride Parade, but rejected for lack of endowment). @DSWBT: thanks for the earworm. @thx1138 Sorry is not enough, never wanted to put YB in trouble. Just thought about passing the message clearly. You’re right, it is an overelobrate production.and a nightmare to organize. Wasn’t aware others might recognize .I thought YB would love this.Why YB didn’t show his discomfort and embarrassment earlier. ?.How can I put him in the show? This is what happens when he disrobes. Regarding recent revelations, and looking at the shuriken-free version… I was forced to think… Tr*mp minus his famous hair-don’t? Although this guy’s got more muscles and less fat. And fingers of normal length. But both are full of hot air.